Apple TV Plus is Apple's first, very big step into streaming video subscription services. The March 25 Apple Special Event introduced the service with a bunch of details about how it will work and who is involved, including some people you may be familiar with like, say, Big Bird and Oprah. It did leave a few details out, including a specific release date and price, which we'll have to wait until fall to find out. Until then, here's everything we know about Apple TV Plus so far. If you're already budgeting for another streaming subscription, I have bad news: the Apple TV Plus price is still unannounced. Apple says "pricing and availability for the Apple TV+ video subscription service will be announced later this fall" so we'll have to wait a while until we can learn how much to start setting aside on a monthly basis. In fact, of the three subscription services Apple announced at the event, only Apple News+ got a price: $9.99 a month. Just like with Apple Arcade, we'll have to wait and see if Apple TV Plus is priced similarly. Much like the Apple TV Plus price, the only thing we know about the Apple TV Plus release date is that it's coming in fall. At least you'll probably be able to watch it on your new iPhone when it comes out, right? The Apple TV Plus reveal featured a grand cavalcade of creators who came on stage to talk up their contributions to the service's exclusive library. There were Reese Witherspoon, Jennifer Aniston, and Steve Carell for a new series called The Morning Show, there was Steven Spielberg for Amblin Entertainment's Amazing Stories sci-fi anthology series, and even Big Bird and, er, another muppet for Sesame Street. 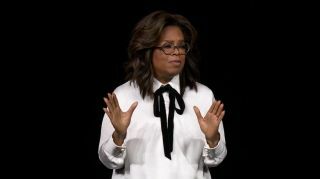 Oprah herself is working on two documentaries for Apple TV Plus which is kind of a big deal too. Maybe not a huge shock that a service called "Apple TV Plus" will only be available from within the Apple TV App, but hey, good to have that clarity. It will live alongside other subscription services/channels in the built-in app like HBO, Showtime, CBS All Access, and others. Everything on Apple TV Plus will be presented ad-free.